UPS announced yesterday that it has further succeeded in turning Portland, Oregon into a parody of itself by choosing it as the pilot city for its new “electrically-assisted tricycle” delivery system. According to a press release, the strange brown tricycle machine started delivering packages on November 21. It uses battery-powered electric motors as well as pedals, and UPS says that “maximum energy efficiency is achieved” when using both methods. If the Portland program works, the company plans to bring Silly Trike to other cities in 2017. One of the grounds upon which Silly Trike is judged is “acceptance of the vehicle,” though, so we’ll see how well that plan goes. Silly Trike is equipped with a window-like shield in the front and a smallish shipping container in the back. It’s unclear what its weight capacity is, but I can’t imagine tumbling over on Silly Trike would be a particularly fun experience, so your 50-inch television probably won’t get to ride in it. 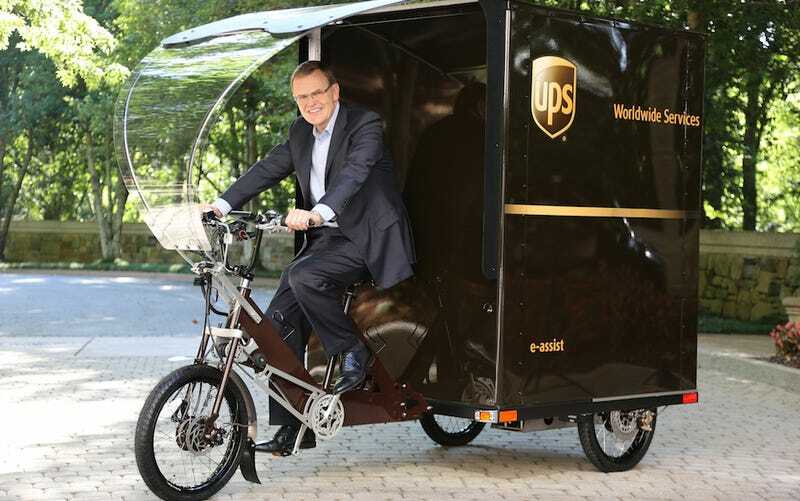 Portland was a logical choice for the first U.S. deployment as UPS already uses traditional bicycles for delivery seasonally in the city. Congratulations, Portland. I knew you had it in you. Of course, while Silly Trike is definitely silly, it admittedly comes with a few benefits, including environmental friendliness and a much lower chance of crowding city streets. Also, now I have something else to make fun of. When I asked Gizmodo night blogger and noted Oregon resident Hudson Hongo for comment on Silly Trike he replied, “Seems legitimately neat!” Spoken like a true Oregonian.